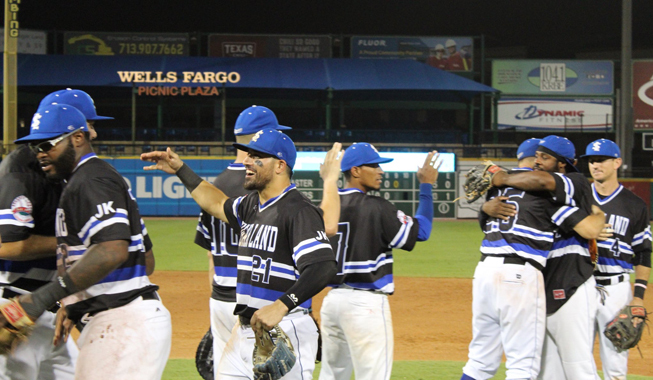 (Sugar Land, Texas, July 1, 2018) - The Skeeters clinched the first-half Freedom Division title on Sunday night with a 6-4 victory over the Lancaster Barnstormers, securing a spot in the 2018 Atlantic League of Professional Baseball postseason. The Skeeters clinched a first first-half title for the first time since 2013 and it secured their first postseason berth since 2016 when they won the Atlantic League Championship. The Skeeters took six of seven games from Lancaster, which entered the seven-game set with a 1 ½ game lead in the Freedom Division, to notch the first-half division title. The playoff berth is the first under first-year manager and former Major Leaguer Pete Incaviglia. The Skeeters have had eight players from their 2018 roster have their contracts purchased from professional baseball leagues, including seven players who’ve had their contracts purchased by Major League organizations. The Skeeters’ current roster also includes 15 players who’ve accrued service time in the Major Leagues. The Skeeters’ first half ends on July 5 following a three-game series with the York Revolution. The Skeeters’ 39-21 record puts them on pace for their second-best first-half record in franchise history. Their best first-half record came in 2013 when they finished the half at 47-23.